Okay guys.. this one is going to be a tough one. I want to start with a little bit of explanations and some context here: I was never one with big skin problems until my doctor convinced me to take the pill for the first time. This was the worst decision ever because it is where it all began: it started with a few bumpy zones on my cheeks and my forehead. The situation went only worse and worse as the days were going by, the bumpy zones turned into mega bumpy areas, swollen from the inside, nothing was coming out of it, it hurt so much and I had no clue about what to do. I stopped taking the pill hoping it would all go back to normal but it never did. That's how I begun my big dermatologists tour: basically going to every good one I was hearing about and explaining my situation in details, hoping they would find some kind of solution. They all gave me the same phony advices such as: wash your hands, wash your face, your pillowcase, try to stick to a routine, use prescription products, don't touch your face, eat clean etc etc..
At some point I was so desperate with my skin that I couldn't even go outside without feeling so ashamed and depressed. People often underestimate what acne can do to someone, I was really feeling so bad in my own skin, I had no way out of this, there were no miracles and Doctors were laughing at me for being over-dramatic and childish for not wanting to go out makeup free etc. It really made me feel even worse about myself so if you are reading this, please don't let anyone make you feel idiotic about what you are experiencing, they don't have the right to do that to you. I finally decided to try the ultimate weapon I heard about: Roaccutane (Accutane or Curacne, depends where you are from). 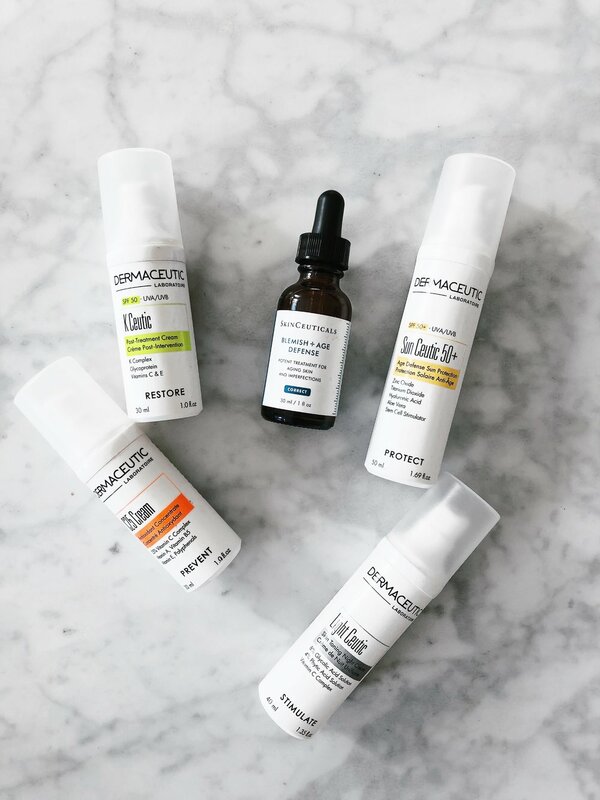 Basically, this is the most effective and strong medication on the market for all types of acne but the most controversial one at the same time. I was under Accutane for one year and a half, the Doctor was always raising the doses since my acne seemed not to be wanting to go away for good. It more or less did nothing. That's also when I finally learned what I was suffering from: cystic acne. Cystic acne is a "deeper" form of acne, it won't form those white/red pimples you are used to see on most of the teenagers faces, the "pimples" are filled with keratin most of the time and they are hidden inside your skin. They will show themselves by creating bumpy areas on your face, they hurt a lot and there's no way to get them out of there since they're deep into your skin. Mine was so agressive that it created holes in my skin, when the actual under-the-skin pimple was gone, I was left with a small hole as a scar which also caused me a lot of sadness because I thought it would never end. Most of the time, cystic acne is somehow related to hormonal problems which makes sense since it is the case for acne in general 90% of the time but what I mean is that it isn't related to your way of eating or your hygiene etc. I think the pill messed up with my hormones so bad that my skin reacted almost immediately to this imbalance in my body. 1st thing: I was a HUGE Coke Zero addict, I could drink between 5 to 10 bottles a day, it kept me awake thanks to the caffeine and made me feel full all the time so I loved drinking it. When I finally decided to stop.. Well.. My skin was already doing SO much better ! I can only imagine what sort of crap is hidden inside it. 2nd thing: I decided to cut off all the fake sugar I could be eating in my daily life. I used to put some in my morning soy yoghurt, some in my coffee, some in my desserts and of course there was some in the my drinks such as Coke Zero, etc. This was certainly one of the best decisions of my life, it helped the process of clearing my skin a lot. For the moment I am still not entirely cured, my skin is very sensitive and somehow complicated, I still break out from time to time but I do have a lot of scars due to all the BIG spots I had. A few weeks ago I decided to finally look for a Doctor in order to begin the process of fixing my skin's appearance. It took me a long time to decide who I should trust with my skin because I mean.. Well it's my skin ! If anything goes wrong, I might have to live with it forever so I better had to be sure of the person who would be in charge of my treatment. I made a lot of researches and found a specialist called Dr Espinoza who runs the Feel Well Center in Geneva, he's an esthetic surgeon which reassured me a lot because he definitely knows what he's talking about. 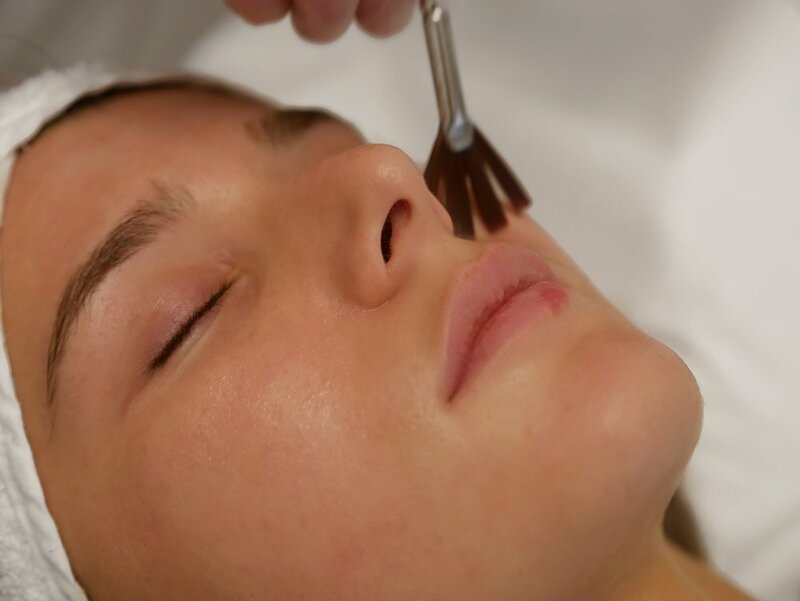 We are beginning the treatment with a chemical facial peeling in 4 steps (4 peelings), one each month during 4 months. 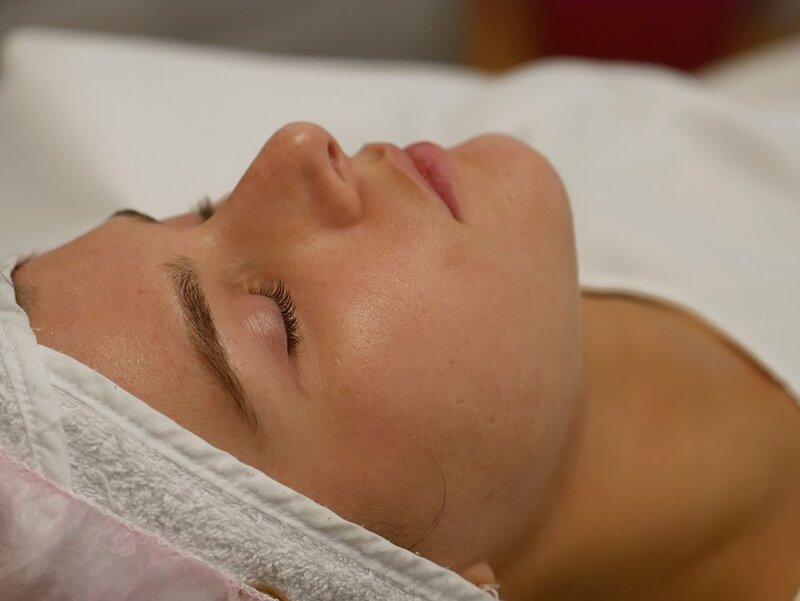 What is the chemical peeling ? it is a concentrated solution made of trichloroacetic acid or TCA. What the chemical peeling does ? it "burns" the surface of your skin and enhances it's renewal process, all of your dead skin will come off in the following couple of days after the peeling has been applied, allowing your skin to look more smooth and less dull. It reduces the appearance of little wrinkles, hyperpigmentation, makes all the superficial marks on your skin go away (such as sun marks for example), evens your complexion etc. Who can benefit from this peeling ? Fair skins ! Unfortunately all of the treatments that we call "resurfacing treatments" aren't adapted for colored skins (matte, dark), this is the only disadvantage about it. The first time your skin has never experienced such a procedure so it will maybe react a little bit stronger (maybe a little bit more rednesses around the sensitive areas), then it will get used to the product so the second one will be a bit more concentrated in order to be more efficient and so on.. until the 4th one. By raising the peeling's concentration, the Doctor also makes sure the results are satisfying for you as the first peeling gets you more of a "glowing" effect as a result, the second one is already a little bit more satisfying if you have spots because you can already see you skin being smoother, from the third one you can see some real improvements and the fourth is really there to erase all the small irregularities of your skin. I currently did the two first peelings and there are still two to go, I thought it would be nice if I separated the experience in two, this way I could 1)introduce you to the procedure and 2) tell you about my observations, my feedbacks etc. (I recommend you to go makeup free on the day of your peeling, this way it will be easier for the technician) etc. Then the peeling is applied on your skin. The peeling can't be on your skin for more than 3 minutes. At the beginning you won't feel it and little by little it becomes itchy, hot and at the end of the 2-3 minutes it is really uncomfortable. The Doctor cancels the effects of the peeling by applying a cream on your face, it will make all the discomfort go away. The cream will have to remain on your skin for the rest of the day because even if the peeling is neutralized by the cream, it is still working its way into your skin. The treatment itself is really quick, you don't need to stay at the Doctors for too long so it's really convenient if you have some other things to do during the day. INFO: Just keep in mind that you won't be allowed to put makeup on for the rest of the day ! Your skin will be too sensitive during this period and it would remove the peeling's effects and we don't want that right ? On this picture you can see what type of scars, bumps and irregularities I have on my skin: my cystic acne created some holes in my skin and they simply won't go away anymore. 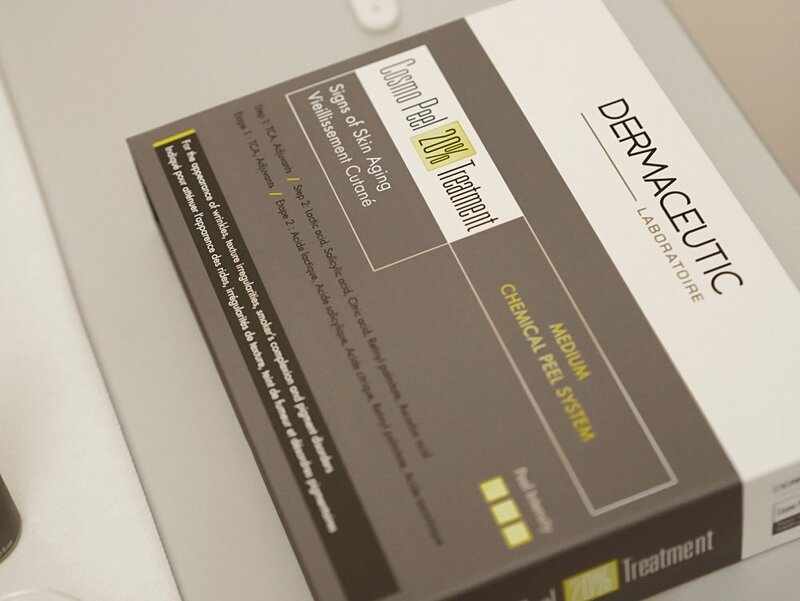 Chemical peeling helps removing those scars, refines the aspect of your pores and skin in general. In my case it is the first step before we start a laser treatment to remove for good all the big holes on my cheeks. As I said, I am only halfway through my second and my third peeling and I still have the fourth to do too. 1) The first peeling didn't do too much on my skin, it definitely gave a glow but didn't do much for my scars. On the first and second day after the peeling, my skin felt tight but didn't start to peel already.. It looked as if it was suddenly made of some sort of plastic material, it was shiny and weirdly flat. It is only on the third day that it started cracking from everywhere as if I had alligator skin on my face. 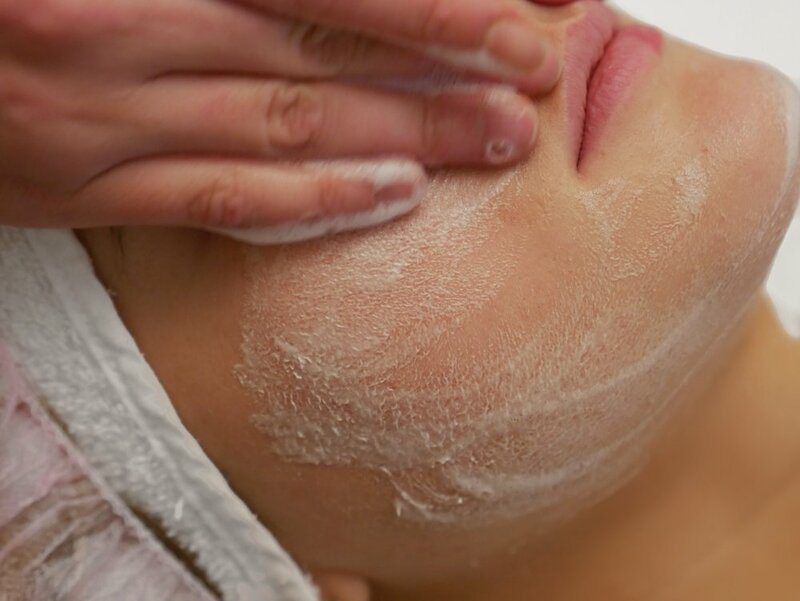 It is recommended not to peel the dead skin off your face otherwise you will force the regeneration process and potentially cause some damages to your skin. What I did -because you know me, I can't really go makeup less for more than a day due to what I'm doing- is that I took a long and super hot shower, it made all my skin very soft so I started to rub my fingers against it this way the dead skin was coming off gently. Of course it would have been better not to do anything, if you have the possibility definitely don't touch it but as I had some pictures to take I figured out it was the softest way to get rid of all the dead skin that would have make my foundation look terrible. 2) The second peeling was already a little bit stronger and I could feel that my skin started peeling off quicker than the first time. I had to use the same under-the-shower technique because I had shootings the next day but this time my skin peeled off a lot more than the first time. When all the skin fell off -after a week everything is gone- I could already see a difference and a nice improvement. My skin was already a little bit smoother and looked nicer, so this is definitely helping a lot and I am confident the two remaining peelings will keep helping my skin to look better step by step ! ° Please don't settle for a cheap option when it comes to you body guys ! I know lots of you may not have the budget for everything you want to do but BE PATIENT, it is better to wait a bit and save money for a real quality treatment than to settle for a cheaper one and maybe experience a catastrophic result at the end of it. I recommend you to always go to see a real DOCTOR and not an esthetician for this type of procedures, because Doctors definitely know what they're doing, they have all the right equipment and knowledge. Of course not all Doctors are good to go to, make some researches and try to find some testimonials about the Doctor you wish to go to, this is really important. When I met Dr Espinoza I just knew my situation was going to be handled perfectly good. I did a lot of researches, saw lots of his interventions' results etc. So I made me feel secured about letting him be in charge of my treatments. Plus, he's a very nice person which is also something that is important when you choose a Doctor, I immediately felt comfortable when I met him the first time. ° Allow time for your skin to recover after the peeling. I am always in a rush because most of the time I have events to attend, people to meet and photo shoots to do so I can't really take the time to let my skin achieve its renewal process perfectly.. Even though I still am very careful with everything I do to it ! Consider that your skin won't look it's very best for during the following week after the peeling, it will be dry and tight, it's completely normal. ° Don't expose yourself to the sun ! Your skin will be recovering from the peeling during all the treatment duration, that's why it is definitely recommended to do it during winter as there won't be that much sun.. But still, keep in mind that you must keep away from the sun and protect your skin as much as possible from it. Here are the creams the Doctor gave me. I have to use them during all the course of my treatment, they are meant to prepare your skin in between each peeling by delivering a small dose of glycolic acid (the peeling's main component) so that your skin becomes more and more used to it.